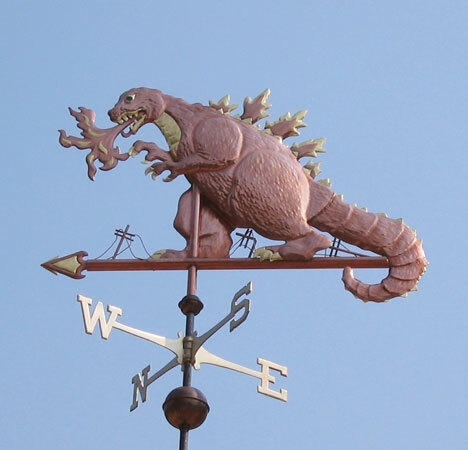 We had a lot of fun working on this Godzilla weathervane project. It was originally commissioned by a big fan of this renowned mutant monster. His Godzilla weather vane was mounted atop a cupola on a new barn he was building. Godzilla (ゴジラ Gojira?) 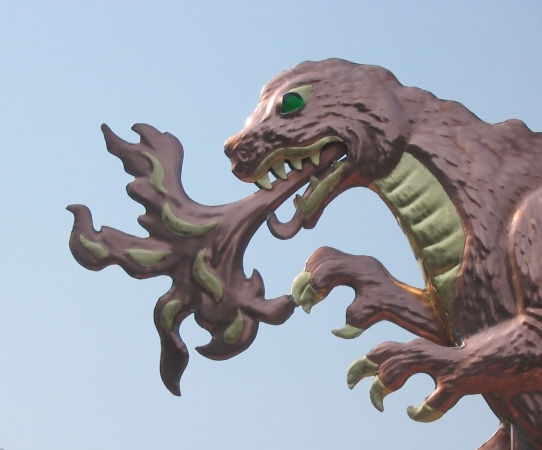 is a daikaijū, a fictional Japanese giant monster. We designed our Godzilla by slightly modifying the head and lower body of a Tyrannosaurus, adding a triple row of dorsal plates somewhat reminiscent of a Stegosaurus, adapting the neck and forearms of an Iguanodon and finally, the tail and skin texture similar to a crocodile. Godzilla was originally believed by many to be green and is frequently depicted in artwork and film this way. Because copper patinas green over time, our Godzilla weathervane will eventually take on his classic coloration. Our customer specified optional gold leaf on Godzilla’s atomic flames, teeth, belly, parts of his dorsal plates, claws and toes as well as sections of the arrow tip. 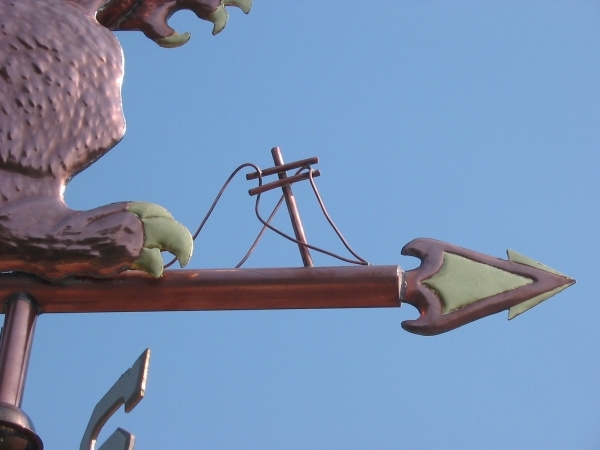 Because we craft each sculpture piece individually, depending on your preferences, your weathervane can be ordered in all copper or a combination of copper, brass and gilding. We are happy to help if you would like input on the metal combination that is right for your weathervane. 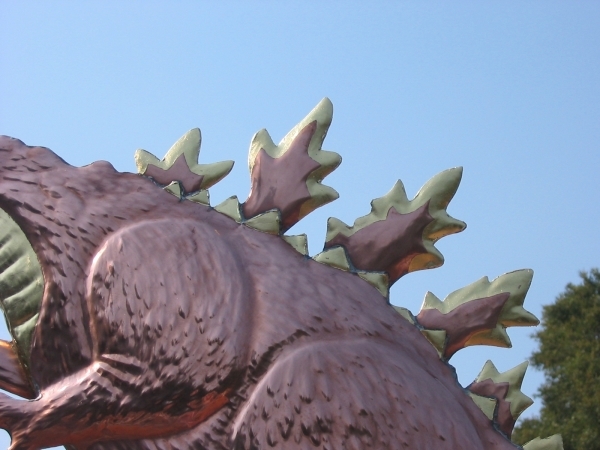 The mythological Godzilla first appeared and attacked Japan at the beginning of the Atomic Age. In his earliest iterations he was a scary, threatening monster, bent on destruction. This is why we depicted him trampling telephone lines. Mutation due to atomic radiation is presented as an explanation for his size and powers. The most notable of Godzilla’s resulting abilities is his atomic breath: a powerful heat ray of thermonuclear energy that he is able to fire from his mouth, hence the shooting flames. Over time, he has morphed into a somewhat more sympathetic figure, even heroic and is now considered a major pop-culture icon. At this writing, Godzilla has appeared in 28 films as well as well as numerous comic books, video games, and novels. Godzilla is a part of our larger series of mythological weathervane designs that also features Dragons, Mermaids and a myriad of other mythological weathervane designs. Please visit our Mythological Weathervane page to learn more about our other Mythological weather vane designs.